Originating from Thailand, hand-rolled ice cream is all the rage these days. 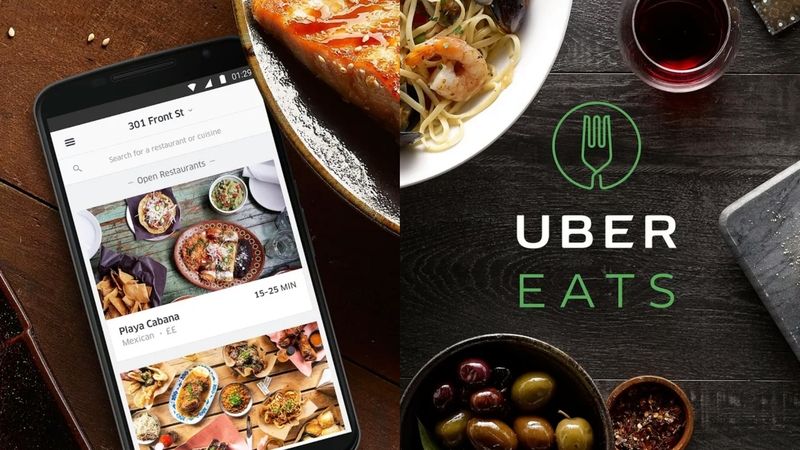 First taking LA and New York by storm, the craze has hit our fair city over the past few months. 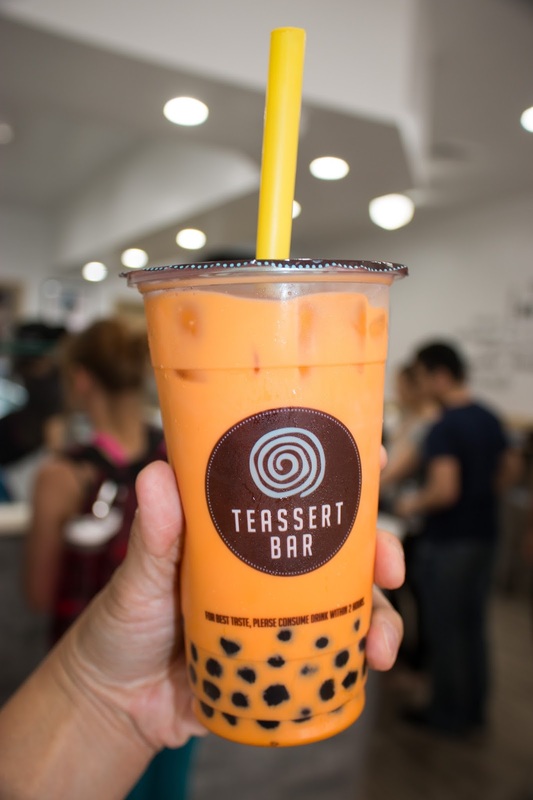 The most recent entry comes from Teassert Bar in Chinatown. It's a bright, inviting space that was definitely a cooling respite from the muggy heat wave. There's plenty of seating, with Jenga, Connect Four, and free Wi-Fi to enjoy with your ice cream or bubble tea. The Thai Iced Tea was everything you'd expect - cool, refreshing, creamy, and sweet. Teassert offers freshly brewed teas with pure cane sugar - there's no fructose or artificial powders at all! You can customize the sweetness and ice levels and choose from tapioca, popping boba, or lychee jelly as well! But really, it's all about the hand-rolled ice cream. 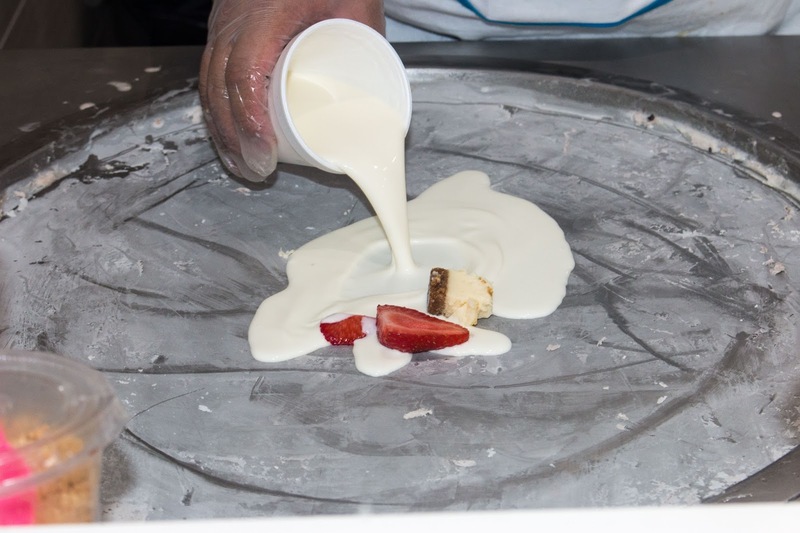 On what is basically an anti-griddle, the ingredients for your ice cream are poured on. How fresh is Teassert Bar? Literally only three ingredients were used to make our strawberry cheesecake ice cream. Cream was poured on top of strawberries and cheesecake, chopped, and then rolled out to a wonderfully creamy consistency. We first tried the Hong Kong style waffle, which is a crisp egg-based waffle that had a wonderful texture with the subtle essence of green tea. A nice juxtaposition alongside the creamy strawberry cheesecake ice cream. Better yet? 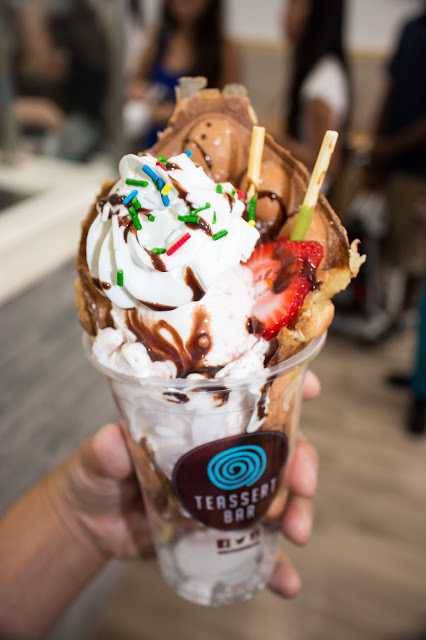 Unlimited toppings including fruit, chocolate, whipped cream, syrups, and Pocky sticks! We also enjoyed the Snickers, which had peanuts, caramel, and chocolate interspersed within the hand-rolled ice cream. 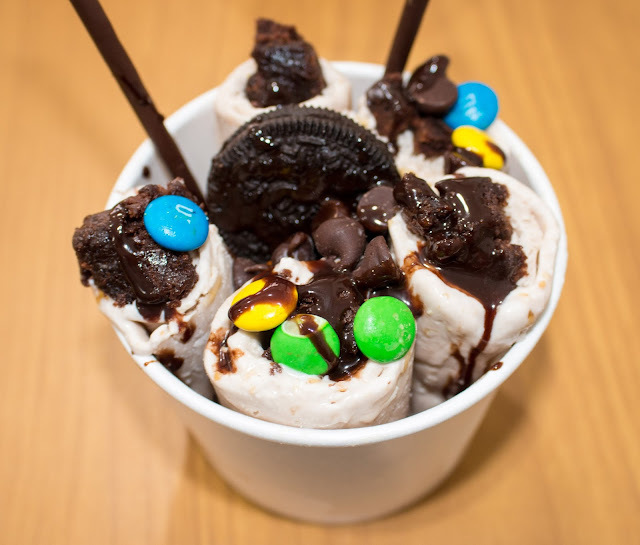 Topped with brownie bits, M&M's, syrup, and Oreo's, this was a decadent delight! 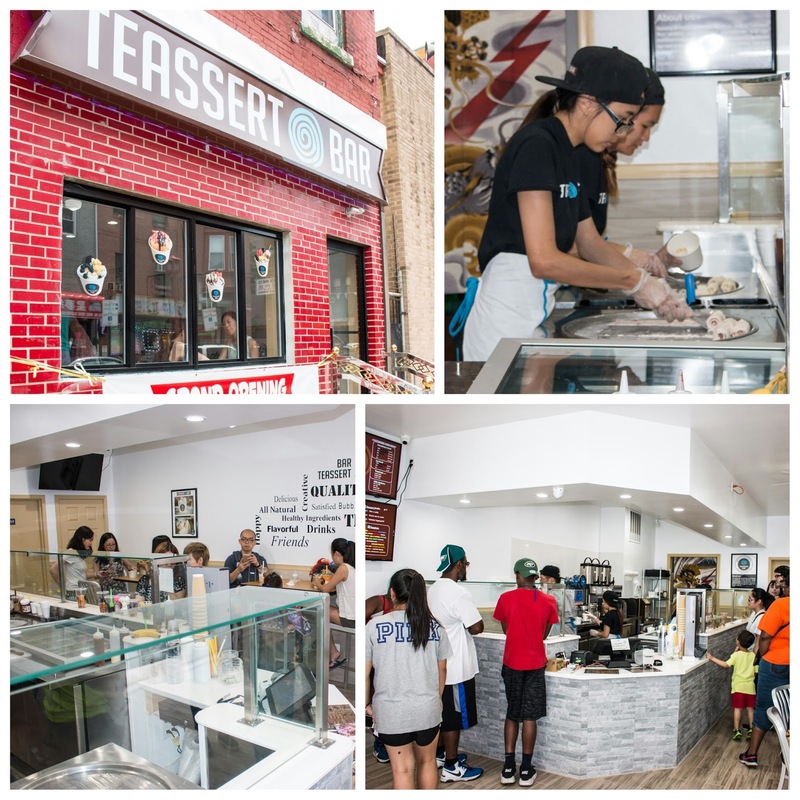 So if you're looking for the latest fad or simply want high-quality and hand-crafted ice cream, be sure to check out Teassert Bar! For those that are lactose intolerant, they offer non-dairy sorbets as well. Do keep in mind that they really are crafting the ice cream right in front of you, so it'll take a few minutes. It's not as simple as scooping out of a gallon drum and moving on to the next customer. But trust me, it'll be well worth the wait! FTC Disclaimer: Thanks to Stephen for reaching out to invite us to the Grand Opening. Regardless, my opinions are mine alone and, therefore, unbiased.